A-simple-as-possible computer with the 8085 CPU. Wait a moment - why OMEN? I am writing a book about old computers. Oh, sorry: I mean "vintage computers" from the '80s. My primary goal is to show how one can build an 8-bit computer from scratch. This means: how to set up a CPU, how to connect memories, how to connect peripheral chips, and why to connect. This computer is a "demo construction:" a computer, based on 8085 CPU, with 32kB of (EEP)ROM and 32kB of RAM, serial connection, and parallel ports. All should be as simple as possible. And here is a result. It is simple. OMEN is an abbreviation (of course) of Czech expression "Osmibitový Mikropočítač pro Elektronické Nadšence," which means "an 8-bit Microcomputer for Electro Enthusiasts". Of course - when I have connected the speaker and played a tune, the first tune I have implemented was... right, "The Omen" by Prodigy! You can set desired values into registers by the R command, including the PC register, and then run program by the C command. 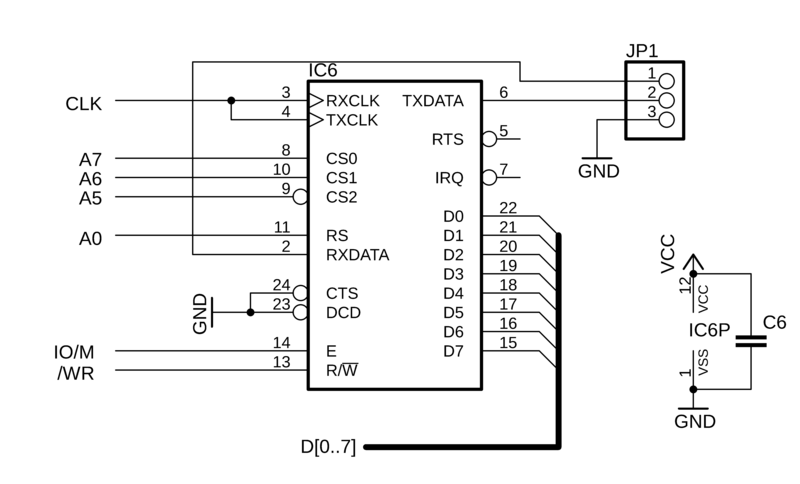 EEPROM contains TINY BASIC at address 1000h, so enter G1000 to start BASIC. I have added the MON85 monitor by Dave Dunfield. Not the original one, but the improved version by Roman Borik. You can find all of the source codes and ready made images on GitHub. Command R displays all flags of F register (SZKA3PVC). If flag is not set dash '-' is displayed. Added restart vector RST 8 (0040h) for possibility to handle RSTV call. Changed TRACE mode. After entering TRACE mode, instruction on actual PC and content of registers (if it is switched on) are displayed. Entering a space ' ' executes this instruction, and returns to the 'T>' prompt with the next instruction. Instructions LXI, DAD, INX, DCX displays argument 'SP' rather than 'S'. Commands that requires 1 byte parameter raises error if entered value not fit to 1 byte. Command 'C' checks overlap of source and destination block and for copying uses appropriate direction. Command 'F' checks <start> and <end> parameters and raises error, if <end> is lower than <start>. Added command 'H' to send out memory content in Intel HEX format. Sending of LF and CR characters were reversed and are sent in the usual order - CR first and followed by LF. As easy, just write a program in assembly language, compile it to the HEX and copy/paste to serial monitor. Then use G command (as GO) to run. A little bit improved PCB is on its own way - 10 pieces should arrive next week. So I will test it and upload SCH, BRD as well as Gerber files. 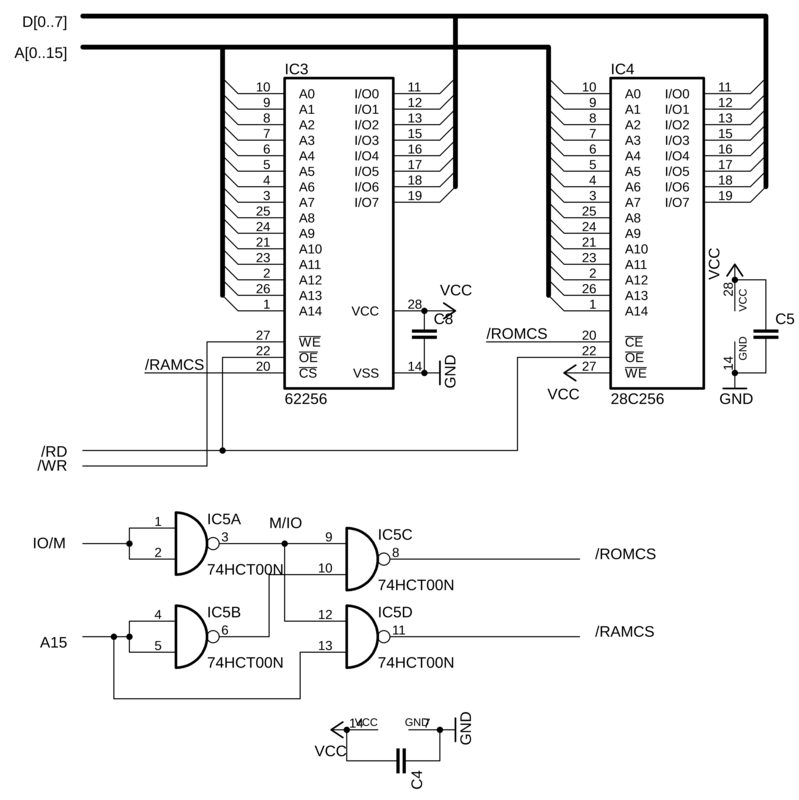 Simple SPI simulation by port PC of 8255. JP7 is RST7.5 enabler. Close to disable interrupt, open to enable. JP2, 3, 4: square marks the "Vcc" pin. A "sneak peek", or What is coming? Here is the classic peripheral device for a single board computer: LED 7segment display and a hexadecimal keyboard. You can buy it on eBay or AliExpress for about 3 USD. It provides the modern LED display driver and keyboard scanner. 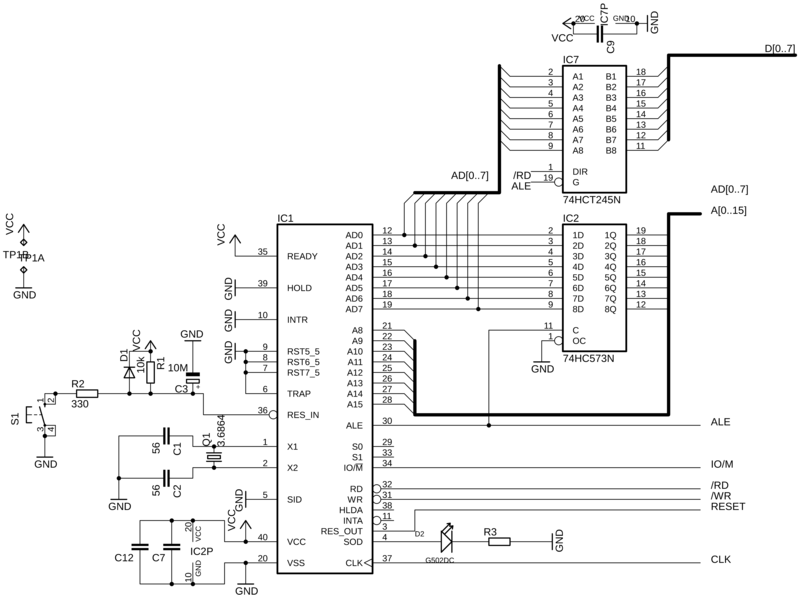 It has a serial interface - not an UART, but some kind of SPI with bidirectional data line. 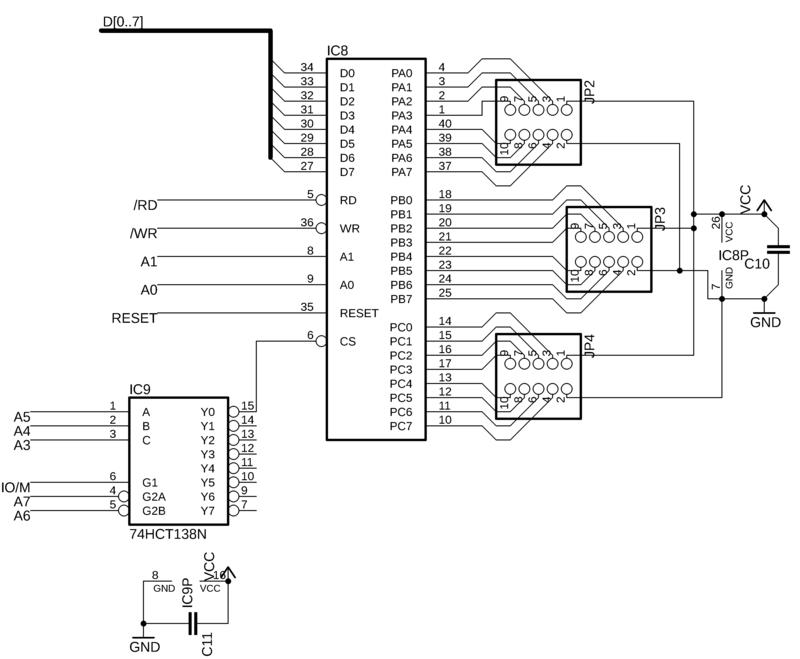 You need three pins to connect this module: strobe pin (output from CPU), clock pin (output from CPU) and data (bidir). So there was a problem: How to achieve a bidir interface in the OMEN Alpha? 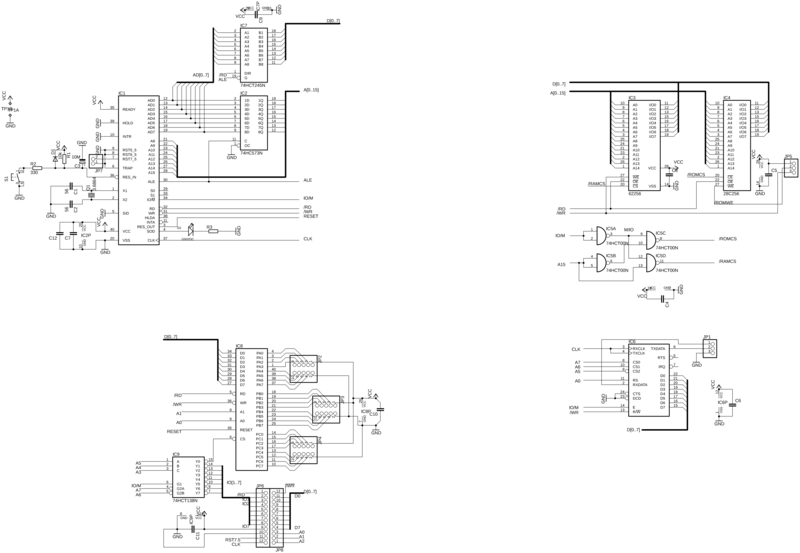 I have used the 82C55 parallel interface, port C. Port C can be split into two groups (higher and lower half, PC7-PC4 and PC3-PC0), which can be configured as input or output independently. Ports A and B has the same direction for the whole port. So I have set the lower half of port C as output for STB and CLK, and the upper one I can switch between input and output. Data pin DIO is connected to port C pin 7. Here is a source code for the driver. It is not optimized, straightforward and rather ugly, but it works! - Removed the LED and 330R resistor. 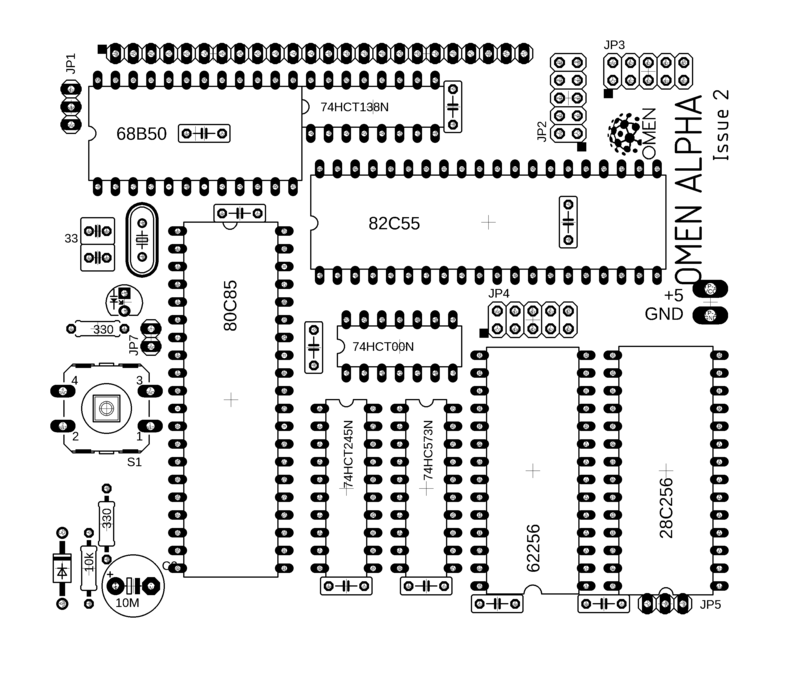 Three pins are added: SID, SOD and GND to enjoy a serial port. - One place for 22pF capacitor was removed. I plan more OMENs named Bravo, Charlie, Delta, Echo, etc. Bravo is similar to SBC, but with 65C02 CPU. And other ones? Stay tuned! it allows control the computer via serial port (115200 Bd, 8-N-1) and a basic set of commands.